Ah, back to crafting after some months off, but it feels great to be back in action! It’s crafting season and I like to post the items I have for sale as well as provide some history and pictures of restoration to show the process. 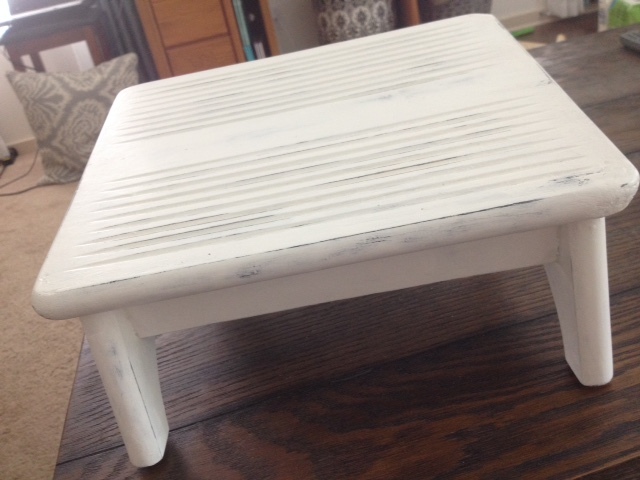 Here we have a mid-century (50’s/60’s) footrest. These were used primarily by those who are petite and sat a lot all day at a desk. I personally picture Mad Men-esque typists with white gloves, but that’s just me. I also always try to research my pieces. Sometimes I find antiques and leave them as is for sale (again, many people don’t know the treasures they discard!). 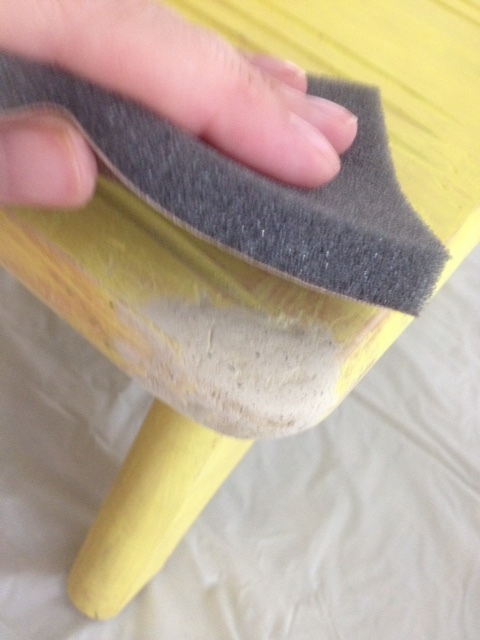 But when I find an item deemed “worthless” due to it’s condition (as is the case with many antiques), a little elbow grease brings the antique back to gorgeous condition, plus you own a piece of history. 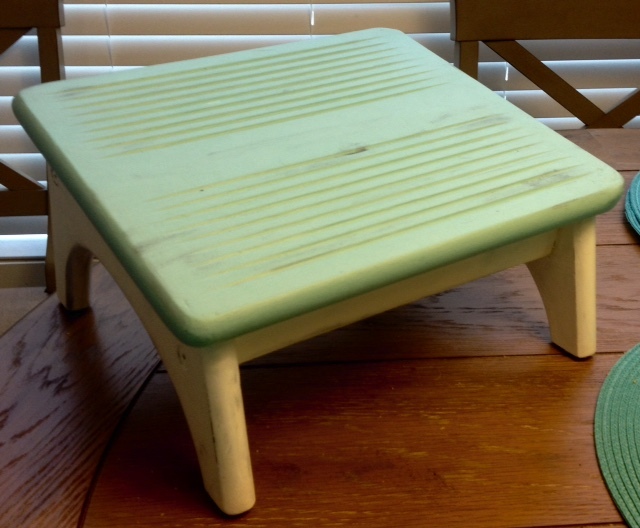 Google “1950’s antique foot rests” and you’ll fine many examples. I couldn’t find this exact one, but it’s actually difficult to find ANY two that are the same. My guess is that they were hand-made by crafters and not mass produced. I found similar styles from the 50’s/60’s with the identical grooves showing that this was likely the “look” of the time. When I found this sad gem, it was in rough shape. 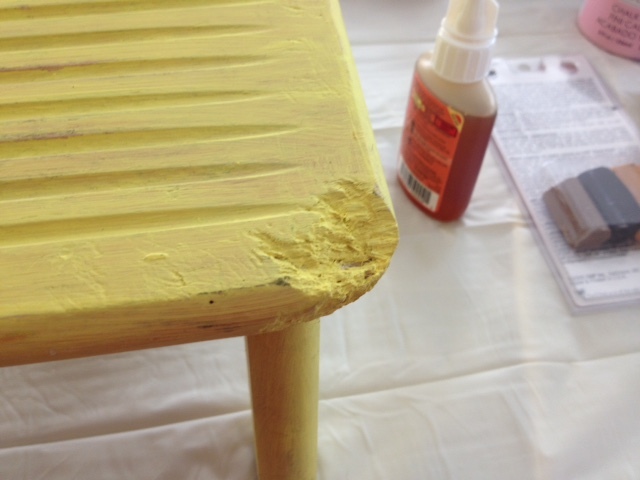 I used Gorilla glue to reinforce the bottom and make sure it’s sturdy enough for an adult to stand on it. 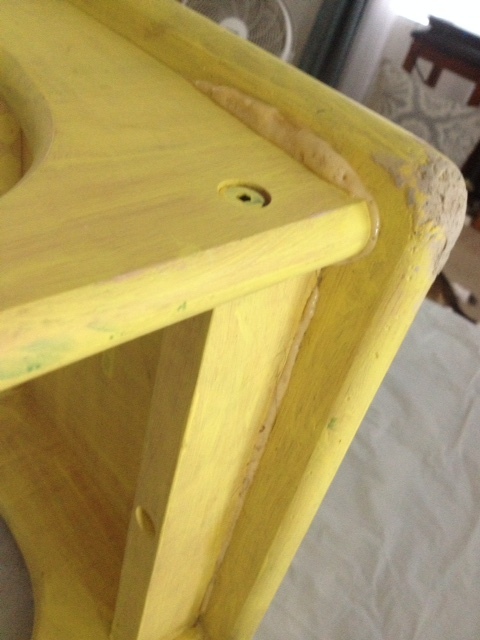 The next part was to care for the corners that looked like a dog used it as a chew toy! This called for several layers of wood filler. 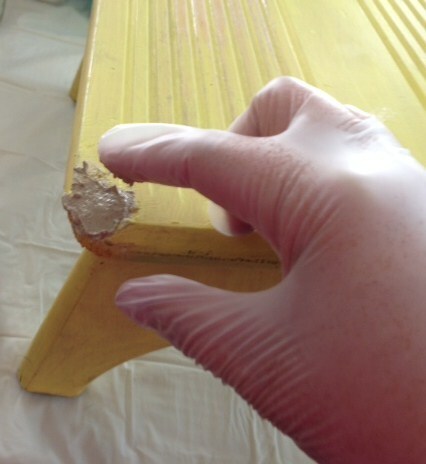 Once that was complete, it was simply a matter of paint. 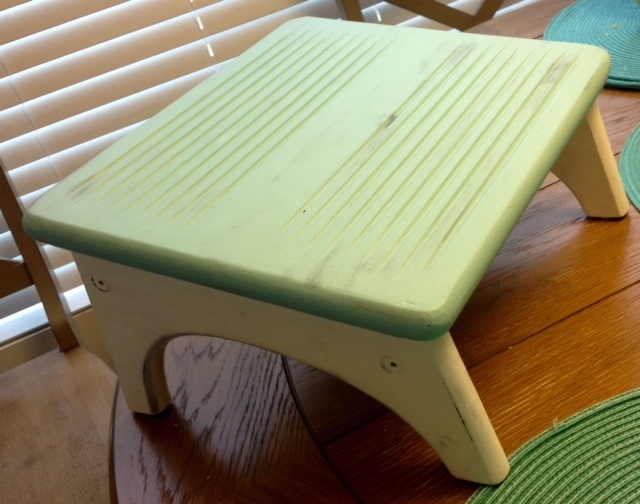 I used chalk paint for the white and a mixture of chalk paint and acrylic paint to get the light turquoise color for the top. When dry, I used a rag with permanent color ink to distress it, along with some sanding and to finish, I waxed the entire piece with sealing wax. Trash to treasure. Bam! Yikes! But yes, it can be fixed! Time to paint! It might take a few layers. I tried this as white, but decided to color the top. Finished! Chose a nice color for the top! 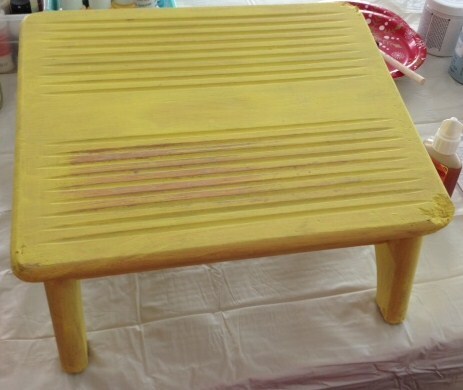 This entry was posted in Acrylic Paint, Antique, Chalk Paint, Crafting, DIY, Uncategorized, Upcycle, Wax Finish and tagged acrylic paint, antique, chalk paint, furniture repair, upcycle, wood filler.